Customers don't want roofs, what they want is "No water in the building"
Building owners and property managers have trusted Clark Roofing to keep "water out of their buildings" since 1946. 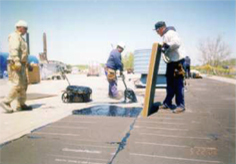 Clark is well-recognized in the Chicago area as a leading provider of superior roof systems and services. When you read our mission statement, and we hope you will, you will see why each employee is dedicated to top-quality workmanship and safe, efficient delivery of service. The way we do it is educate, train, and pay well. Staying on top of changes in the roofing industry is an increasingly complex job. Everything from waterproofing to adhesives to roofing materials has changed and is continuing to change. Today a contractor must maintain expertise in new synthetic materials, chemical compounds and equipment technology as well as employee training, safety and customer service. At Clark, we have this expertise – that is why this business has been in our family for 54 years. Whether you already have water in your building or want to make sure that you never do, Clark Roofing will help you find the right roofing solution for your building – we guarantee it.